Tokyo (October 3, 2011) - Konica Minolta Holdings, Inc. (Konica Minolta) is pleased to announce that it has commercialized Organic Light Emitting Diode (OLED) lighting panels with the world’s highest-level luminous efficacy using all phosphorescent emitters for the first time in the world and starts selling sample kit from today. 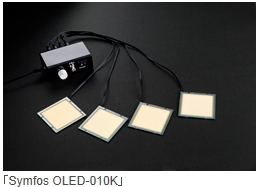 Konica Minolta also announces that it has adopted “Symfos” as its new brand for the next-generation lighting, including OLED lighting. fluorescence and phosphorescence. Phosphorescent emitters are theoretically expected to be four times more efficient than the conventional fluorescent emitters and are regarded as a key technology to achieve low power consumption. By adopting proprietary blue phosphorescent materials, Konica Minolta has accomplished to commercialize all-phosphorescent OLED product for the first time in the world. On this Sample Kit sales start occasion, Konica Minolta is launching a new website dedicated for OLED lighting with information such as sample kit specifications, case studies, and online order-taking. OLED lighting is attracting attention as the next generation lighting having such unprecedented features as thin, light weight, and surface light source. In addition, it features high energy efficacy, no scalding surface, and reduced environmental footprint since it is mercury-free unlike fluorescent lightings. Furthermore, OLED lighting technology is mild to eyes and friendly to people, since it is flat light source and free of ultra-violet rays. Konica Minolta considers OLED lighting as one of the most promising environmental and energy conscious new businesses, where we can fully build on our own core technologies, and will continue to aggressively drive research and development work and marketing activities.